With the Asset Management, you can manage your libraries and add assets directly in Blender with automatic thumbnails creation. Compatible Blender 2.79b for now! All your Assets in one place! The only Addon who creates thumbnails for you! With the Thumbnail Generator, you can create different types of thumbnails: THUMBNAIL RENDER: The Addon generates the Thumbnail of your assets with the default scene. 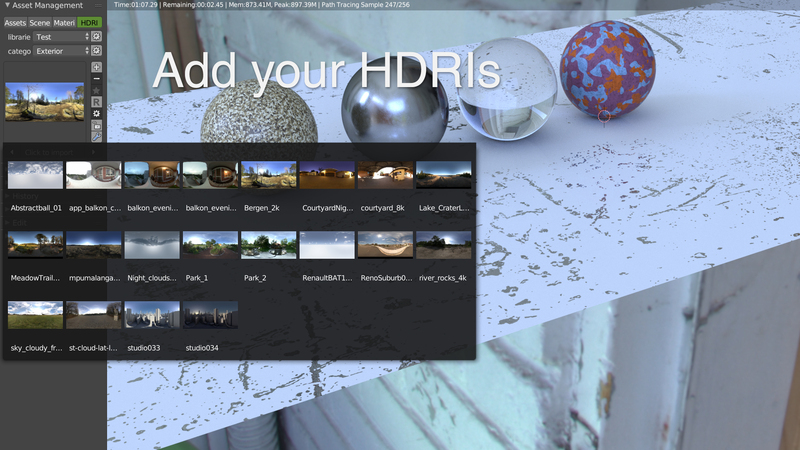 You can configure the shaders in the preferences and create a custom render. You can tweak everything, add an Ambient Occlusion(AO) shader, hide the floor, add a contour or use the shaders of your asset. THUMBNAIL IMAGE: You can use a picture from your disk or use the Render Result. Linking: You can link objects or materials. Smart Import: The Asset Management place the asset on the selection! Nothing Selected: Asset will be placed at the center of the scene. Object(s) selected: Asset will be placed at the origin of the selected object(s). Face(s) selected: Asset will be placed on faces and will use normal orientations of those faces. REPLACE ASSETS: You can replace one or several assets by another, you can do this for linked assets too. The addon jeeps the orientation of the previous asset. EDIT ASSETS: You can Edit an asset directly from the preview. That allows you to make a fast modification of your asset to have it exactly how it should be. The addon will save your current scene, open the asset scene and when you will save it, the addon will open your scene and your asset will be updated. AND MUCH MORE : With the Asset Management you can : Choose to use existing materials or group to avoid .001, .002 etc Delete unused data Use active layer The addon saves automatically your scene in the temp when you add an asset to your library Popup to work in full Screen (CTRL + Double LMB) You can choose to put the addon in the panel T or N You can add different types of assets to your library. 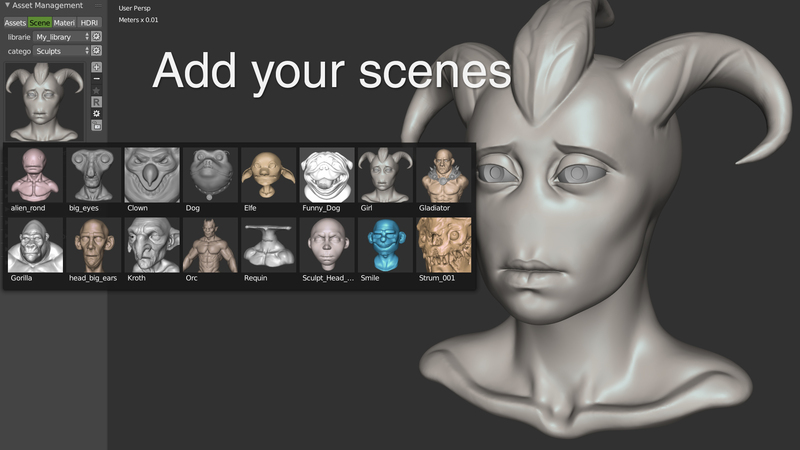 SAVE YOUR SCENES WITH CUSTOM THUMBNAILS You can save complete scenes in the Asset Management. You can create libraries, categories and add custom thumbnails. This is really simple and fast. SAVE YOUR MATERIALS You can save your own materials in the Asset Management. You can create libraries, categories and manage your materials. You can link materials too. 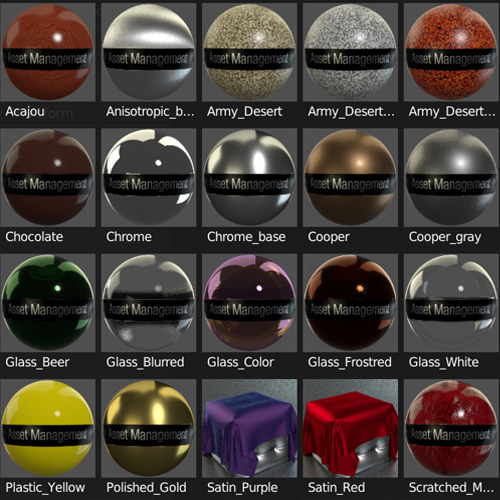 You can also add your own material render scene to customize your thumbnails! 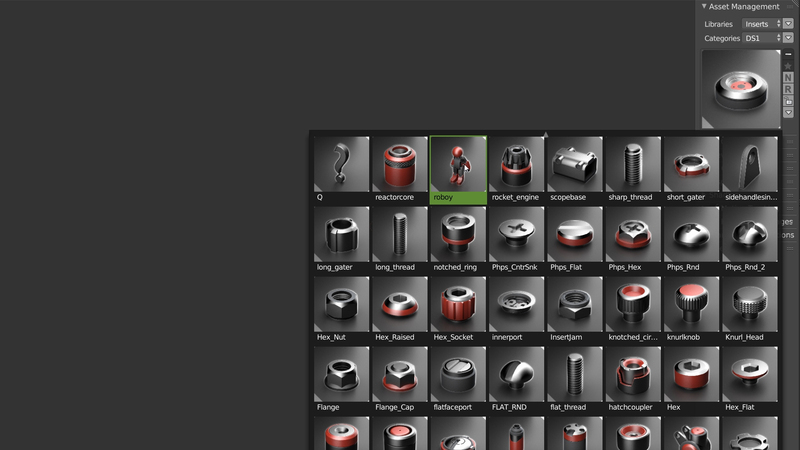 The Asset Management can be used with all the other add-ons on Blender like Hardops. 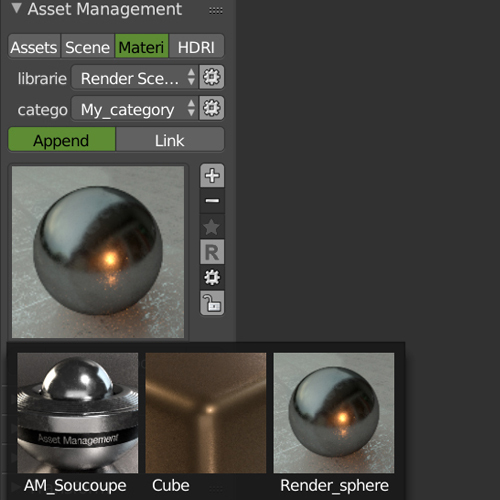 You can also use it with other render engines since the Asset Management makes an append from the library to your scene. 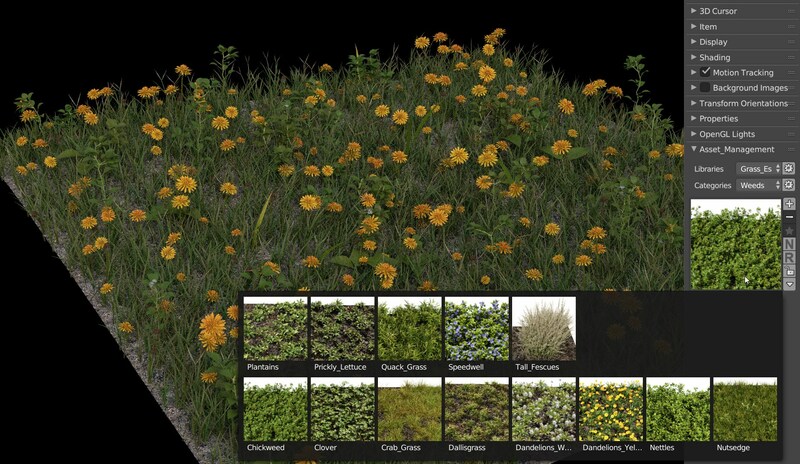 This append keeps all the data attached to your objects, shaders, textures, particles etc. You can create your library easily and use it directly! Screws & Bolts Free Pack! 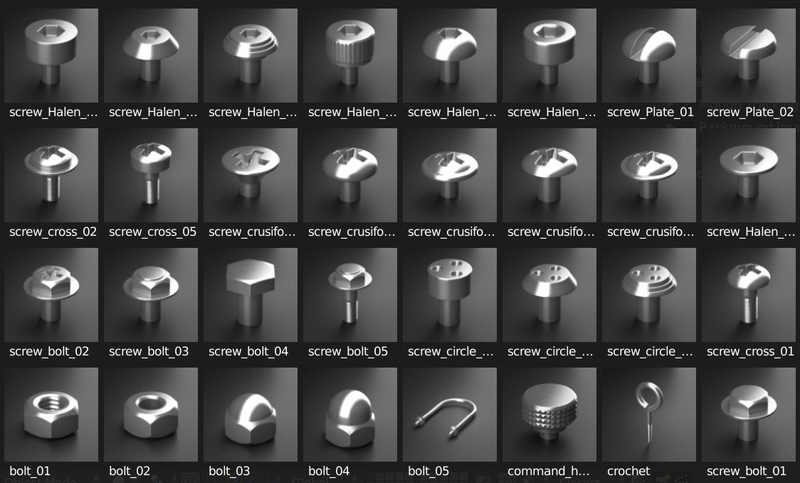 With the Asset Management, we offer you a free pack of 43 Assets, Screws & Bolts! To install this pack, look at this video. https://www.youtube.com/watch?v=TLwpyYBy8qI You can use this pack with HardOps or in your normal modeling workflow, it’s really efficient. We hope you will like this Addon, we worked for months on it and we will continue to improve it! "Customers will have free updates"
For support, come on our Discord server, it's free and easy. This item has an average rating of 4 from 18 ratings by the community. The quintessential "You don't know how much you use it ... until you don't have it." package. Hoping a 2.8 version comes... soon. The best addon for blender. I can not imagine working without him. You must have it. When it will be up to 2.8? Blender 2.79b and all works as expected, this is a terrific addon and crucial for workflow. I am new to Blender coming from Modo and Maya and have spend a bundle to bring Blender to have the workflow that I need, and if I could only keep one addon it would be this. I haven't played with it too much but i like it so far, for what i'm using it for. Blender 2.78 – I just bought it and saw lot of bug appear in console. I install Screw-and-bolt, none thumbnails doesn't appear, i'm little disappointed... the idea still good one ! You must to be more frank to say that is not a ending product. How can we acces to the update ? Otherwise, you put a line in the preferences to 'doc FR' which is an empty place actually. Great addon that works fine and save a lot of time!!! Crashes constantly when importing models. Mostly it crashes when rendering the thumbnail preview. Mac OS X. But has a lot of potential. And once loaded it is great. It´s a huge timesaver specially for pro work. Most used Addon, quick and accessible!